Breaking old records for some statistic or another generally makes for catchy headlines, at least. If nothing else, the fact that the statistic is being tracked (whether or not by Guinness) suggests it’s a matter of more than passing interest. Now astrophysicists have come up with a new find that breaks three records at the same time. This one is a pulsar, designated J1823−3021A, located in the globular cluster NGC 6624. It’s a special subtype of pulsars – millisecond pulsars, which rotate from 100 to 1000 times per second (rotational period from 1 to 10 milliseconds). Research just published about J1823−3021A estimates that, among millisecond pulsars, it has the strongest radiation in the gamma-ray part of the electromagnetic spectrum (about 8×1034 ergs/second), has the highest magnetic field strength, and is probably the youngest known. 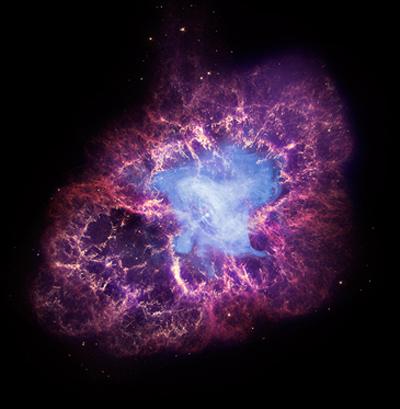 Pulsars are rapidly rotating neutron stars that radiate most of their energy in narrow jets. The jets are aligned with the poles of the object’s very strong magnetic field. As with the Earth, this magnetic axis need not be parallel to the object’s rotation axis, so that we observe the strongest emissions in sharp peaks, like the beams of a lighthouse. Neutron stars are the remnants left of core collapse supernovae whose progenitor stars were not massive enough to have left only a black hole after collapse – generally stars of less than 10 solar masses. 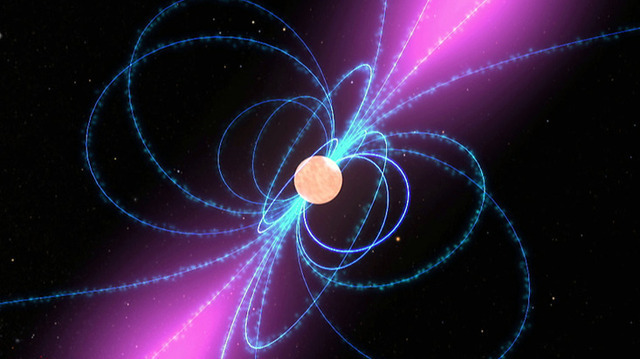 Typically a neutron star starts life with a rapid rate of spin, which decreases gradually with time as the kinetic energy of rotation is lost through electromagnetic radiation. However, if the neutron star has a binary companion it may accrete matter from the companion, thus gaining angular momentum and increasing its rate of spin up to a rate of more than 100 rps.